Note: If you want to freely connect wifi ,you must exclusive's V8 USB Wifi dongle used together.By the way, the signal is better and more stable. ★【CHANNELS INFORMATION】: 6000 channels and Radio; Various channel editing function (favorite, move, lock, skip, delete, rename, find, sort).Support to 7 days Electronic Program Guide(EPG), Parental control for channels. 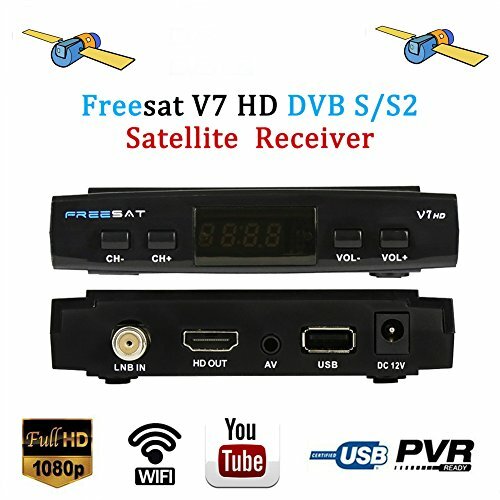 ★【1080P FULL HD DVB-S/S2】: Full HD Digital TV Receiver, Freesat V7 HD is a High Quality mini DVB-S2 Receiver, enables you to freely enjoy plenty of Free to Air TV Programs and Air Radio Programs. ★【MORE FUNCTIONS】: Automatic PAL/NTSC conversion; Support PowerVu, DRE & Biss key; Support Full speed USB 3G dongle; support Video and Audio Decode; Plug and Play installation, with an easy to use Menu System. ★【WORRY-FREE GUARANTEE】: Technical support website: www.freesat.cn/forum/ ; 24h post-sale customer service, please feel free to contact us if you have any problem.You will get friendly service for sure. If you have any questions about this product by DMYCO, contact us by completing and submitting the form below. If you are looking for a specif part number, please include it with your message.